...in the form of IKEA's Anna! You just said : That's a lovely microphone you're wearing. 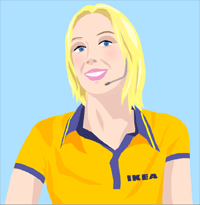 I'm an IKEA Online Assistant, I don't wear real clothes. You just said : Saucy! I'm not sure what you're trying to exclaim. Please be a little more detailed if you can. You just said : You wear virtual clothes? to give you a proper answer. Please try again. You just said : Do you sell Volvos? Transport is not something about which I'm programmed to discuss. Sorry. You just said : Are you Swedish? Let's talk about IKEA now.